WWE's utterly pointless 'World Cup to determine the best in the world' (no, really?) came to an end at Crown Jewel this Friday, and the winner was right out there, to say the least. A tournament consisting of Kurt Angle, Seth Rollins, Dolph Ziggler and Rey Mysterio was eventually won by none other than... Shane McMahon! Yup. You couldn't make this up. The Miz and Dolph Ziggler collided in a SmackDown vs. Raw clash in the tournament's final, only for an 'injury' to sideline Miz early on. 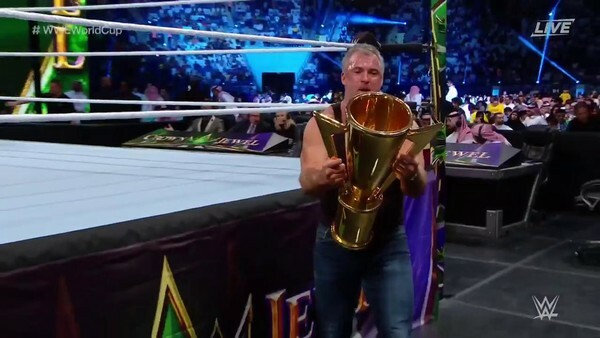 Instead of Ziggler being awarded the cup by default, he instead had to face substitute Shane. Obviously. Of course, Shane's ego being the size of Alaska meant he naturally prevailed, besting Ziggler with a coast-to-coast to distinguish himself as the finest wrestler on the planet. Again: you couldn't make it up. McMahon will now almost certainly captain his SmackDown team for the interbrand conflict come Survivor Series, a match which could realistically involve Shawn Michaels, The Undertaker, and heck, Hulk Hogan, because why not? Shane's victory feels like WWE making a mockery of a show that was a farce to begin with... but given it's Shane, you can guarantee the accolade is to be taken entirely in earnest.